Welcome to my world. Huh, I didn’t expect it to be so depressing. It probably won’t surprise anyone that we go through a lot of paper. The rolls of it we have in the back print shop are just insane. But more than that, it’s just a paper-laden job. Things still come in the mail or past the front desk. People love to print press releases instead of sending them via email. Our weekly budgets (list of stories per issue) are all hard copies. I prefer a pretty paper datebook to fancy computer calendar apps. I’m sure there’s more examples. I’m just getting tired thinking about it. Lunch at my desk. Again. In the summer, I like to take my lunch to the park. 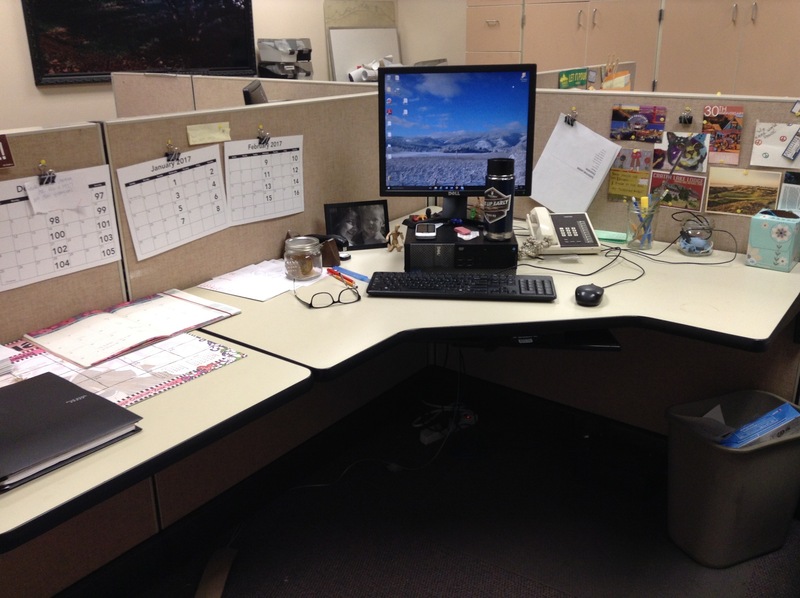 In the winter, you can’t get me outside — well, unless you want me to meet you at the coffee shop — so I generally just eat at my desk (because the break room is scary). Everyone is used to my reusables at the office. I’ve noticed I’m not the only one, which is nice. Solidarity, etc. P.S. You can sort of make out my Kleen Kanteen in the righthand corner. I’m never without that thing. Coffee emergencies are real, you guys. This is where I keep everything I’m supposed to file from HR, paper I can recuse because it only has printing on one side, my reporters notebooks, my tins of paper clips (I miss those cinnamon mints, by the way. Wrapped in plastic. Gave them up for the project). I think there might be a lip balm in there somewhere. I have so much paper to reuse that I’ve decided to forgo the reporters notebooks from now on — but I need to figure out how to bind it in a way that will allow me to take it on those rare moments I’m out on assignment. Incidentally, I’ve also decided it’s pencils for me from now on, as soon as my pens run out. Well, the ballpoint pens, anyway — I need my red pen for corrections. My second drawer is a little neater. I don’t really have anything in my second file drawer except some tea (reusing the tin; it’s stuffed with tea the girls decided they didn’t like, and sometimes I just need something hot), a glass jar for just in case (my most recent addition), a spoon and my Ron Swanson mug (which is a prized possession). 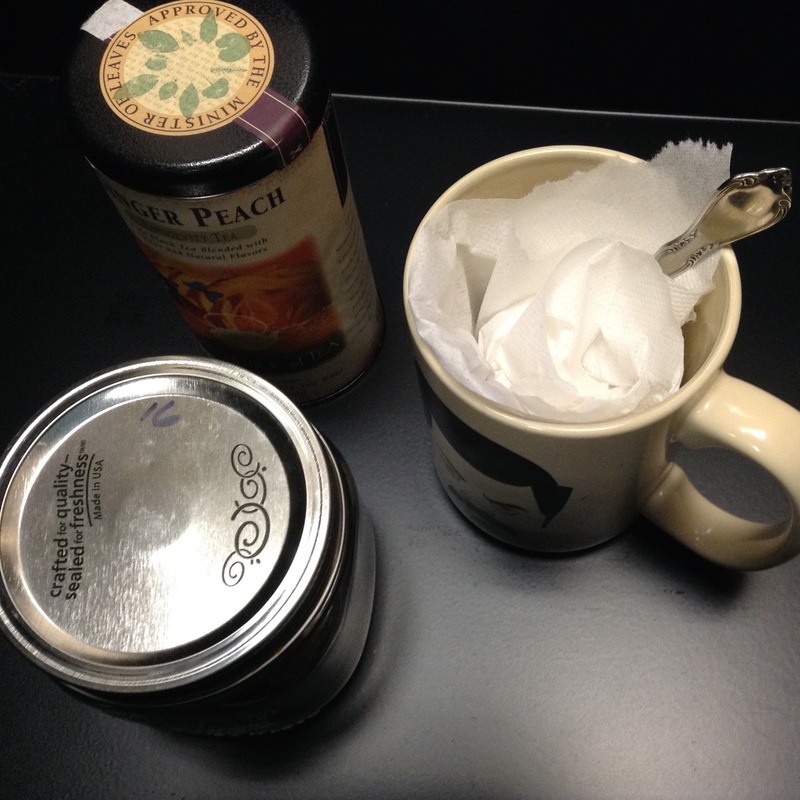 I keep meaning to bring a hankie to stuff inside the cup — I have issues with things getting dusty and it freaks me out to have the mug just in the open … even if it is in a drawer — but I haven’t gotten that far, so yeah, that’s a paper towel inside that thing. You know what? Screw that. I just put a hankie in my bag (one of my grandma’s that’s embroidered. It hurts my nose). No more paper towels. I never did get an emergency work kit sorted out with reusables. You’d be surprised how far you can go with a mug and a spoon, though. 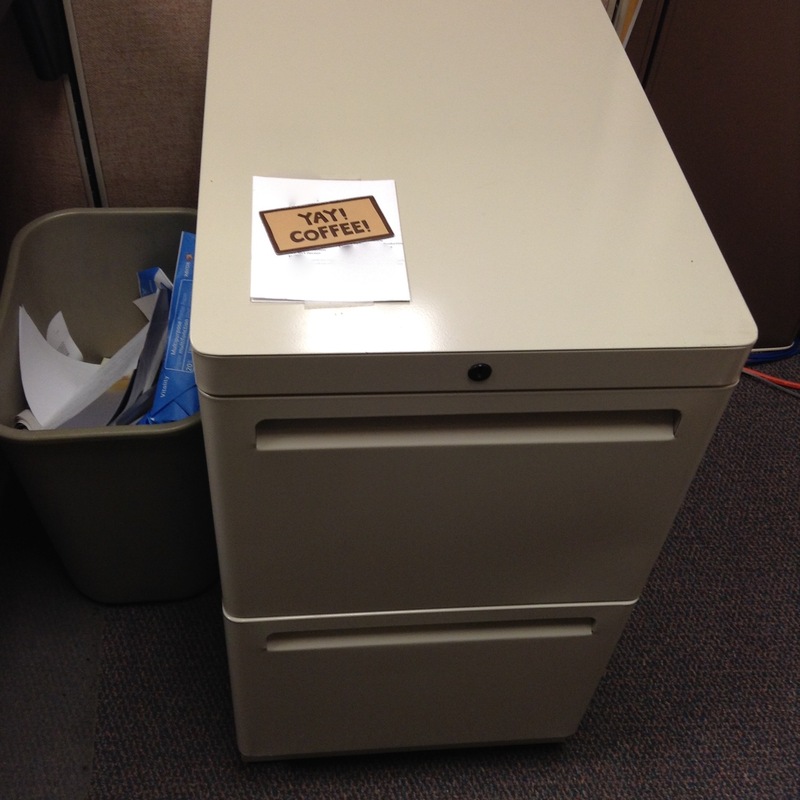 Beside the file cabinet is my recycle bin. Everyone else uses these for trash cans. But I don’t need one that big. I have to empty this thing about once every three months. 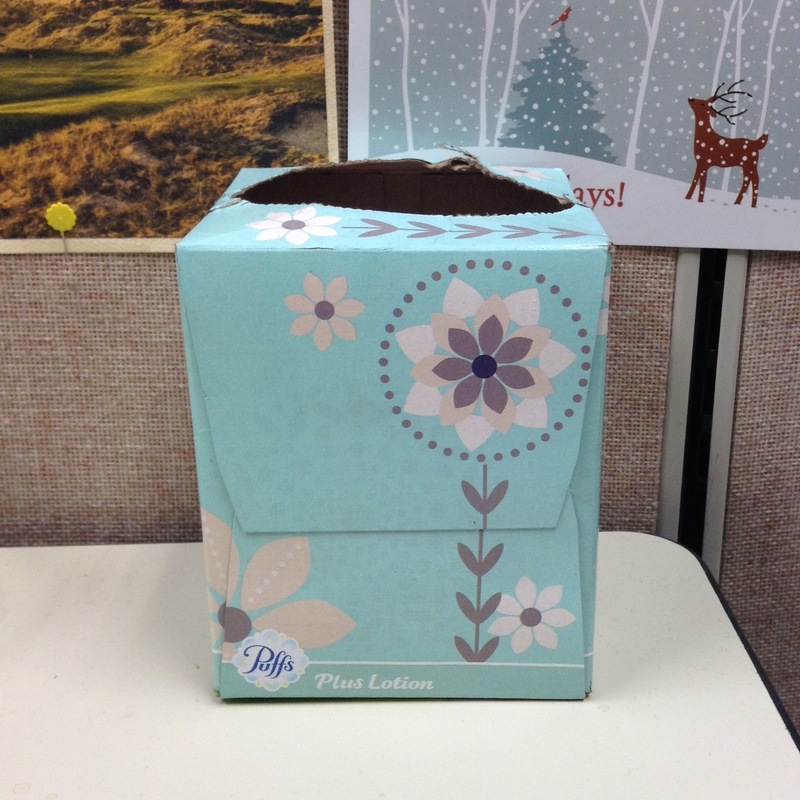 A couple of years ago, I decided to make a tissue box into my trash can. I don’t usually have a lot of trash, but sometimes it’s unavoidable. I was weak at the company Christmas party. Nothing like a little public humiliation to make you rethink your single serving chip selection. Even if it was on a buffet. In December. My coworkers generally know about my minimalist and zero waste leanings and no one thinks it’s weird (anymore). Or maybe they’ve just accepted that I’m weird. Looking at the photos, I am wondering what else I can do. I’m going to really have to think about that. I feel like I have lots of control over zero waste at home, but not as much at work. And while I am happy with what I’ve been able to do, none of it has been too difficult — which makes me wonder if I’m trying hard enough. UPDATE: As promised, here’s a photo of the scary break room. I know it doesn’t look scary, but that’s just because you can’t sense the funky smell or hear the hum of the Pepsi machine … or see the inside of the fridge and sink. 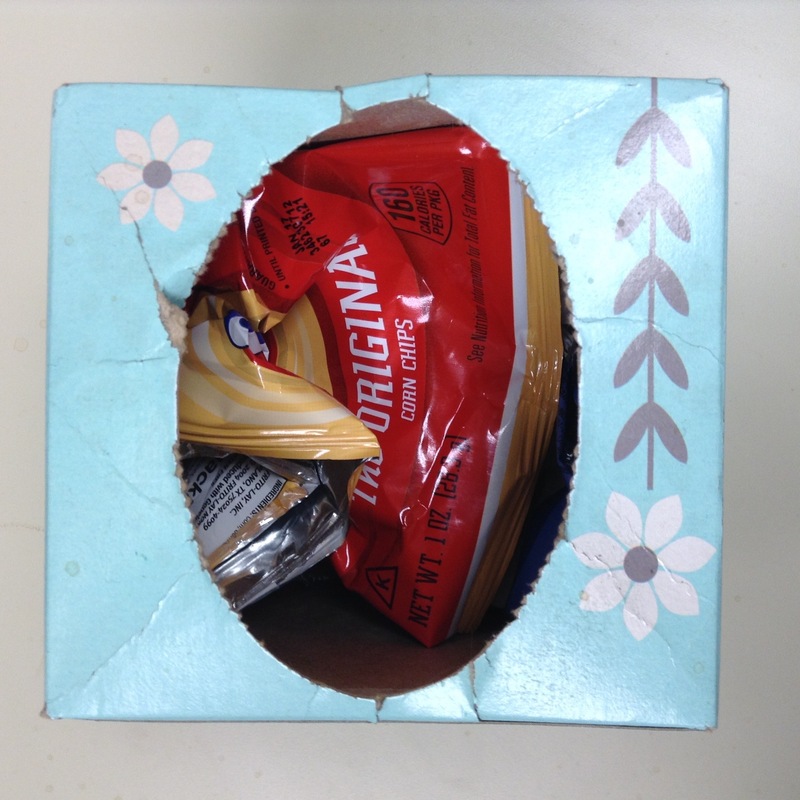 This entry was posted in zero waste and tagged recycling, reusables at work, reusing paper, zero waste fieldtrip, zero waste office. Bookmark the permalink. Looks like you might use some of the scratch paper for jotting notes – maybe get a whiteboard for that kind of thing when you’re taking notes on the phone, etc? Oh, I forgot to write about that part. I use scratch paper daily to keep track of which pages are out the door on deadline day and what I need to put online, who’s called, who I need to call, story ideas, my to-do list … well, you get the idea. I need to be better about saving the sheets without folding them in half — kind of second nature for some reason — and giving them to our publisher to reuse. That’s how she stocks her printer, which I appreciate. It just occurred to me that we’re in the same building as our printing press operation … and I bet someone back there could bind the pages together for me into little scratch pads or books. I’m going to ask! Any ideas on paper towel use in the bathroom? I used to use 3, cut it down to 2, trying to use 1, but it just doesn’t do the job. I have a friend who brings her own cloth towel to the bathroom to dry her hands. I just use one paper towel and then wave my hands around frantically to finish the job. Bonus: I’m pretty sure all that movement counts as exercise. 😉 Or sometimes I just pat them dry on my sweater. I thought about bringing a towel, but the bathroom is quite a long walk from my desk and don’t think I want to carry a towel around the building. And then where do I dry it? This reminds me of when I was small and we would stop at gas stations to go to the bathroom on car trips, and they would have a cloth towel roll. Eew. Thought it was gross even when I was only 6 years old. Yeah, right? That’s why I don’t bring one either — just not practical. (Easier to flail, LOL.) And YES, totally remember those towel roll thing, and yes, I was grossed out by it too! 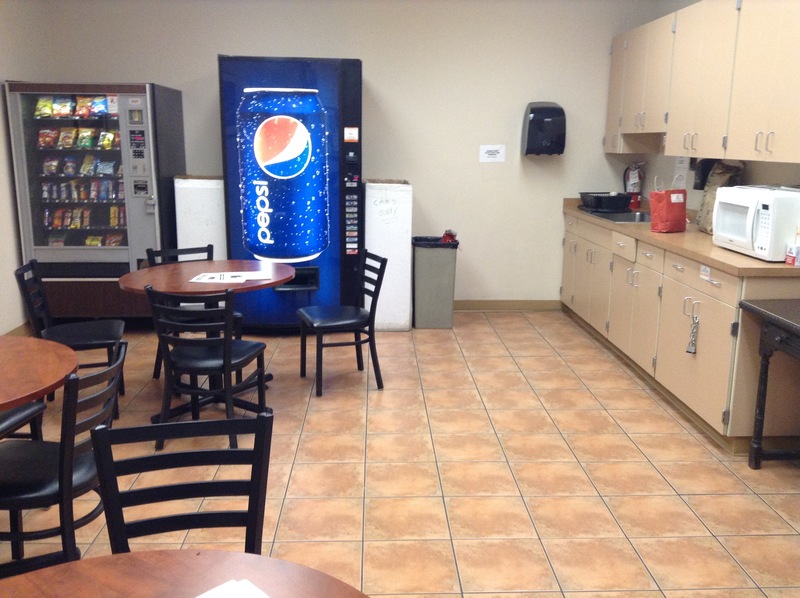 I want to see a picture of the scary break room! 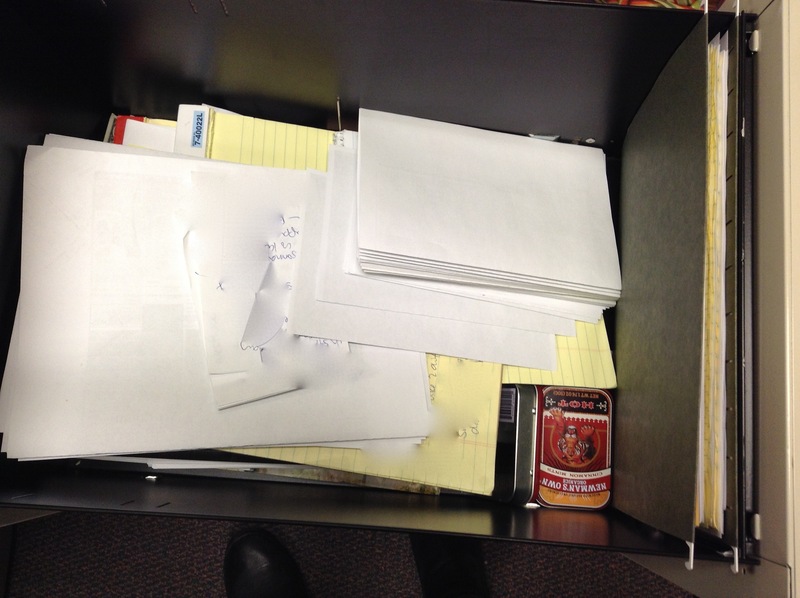 Your desk drawers looks cleaner than mine. I think I need to declutter my drawers every 6 months. But I keep my desk top clean as much as I can. Agreed on the desk top — stresses me out when it’s cluttered. Nah, that’s not too scary. I’ve seen worse than that. Although, I admit, the smell could really add to the scariness in person! Thanks! Love your blog. I should have taken a photo of inside the fridge — THAT would have upped the scare factor! 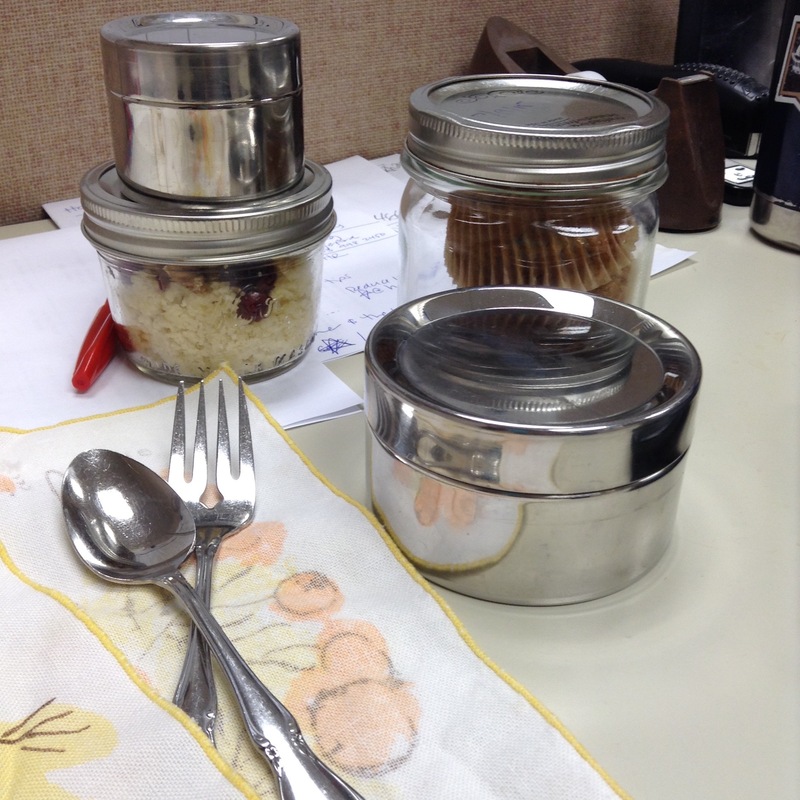 I only temp casually, but all of the offices I’ve worked in have stainless steel cutlery, mugs and plates available. I really loathe the idea of hankies, so use toilet paper (my kids think we are weird as we don’t have Kleenex in the house). If I’m at a job for more than a week I will bring my own loose leaf tea and mesh strainer. At my current job, one of the women is very into tea and offered me a cup of her lovely pot of Fair-trade, organic Earl Grey tea in a pot. Such a pleasure and so thoughtful of her. Love the Ron Swanson mug! 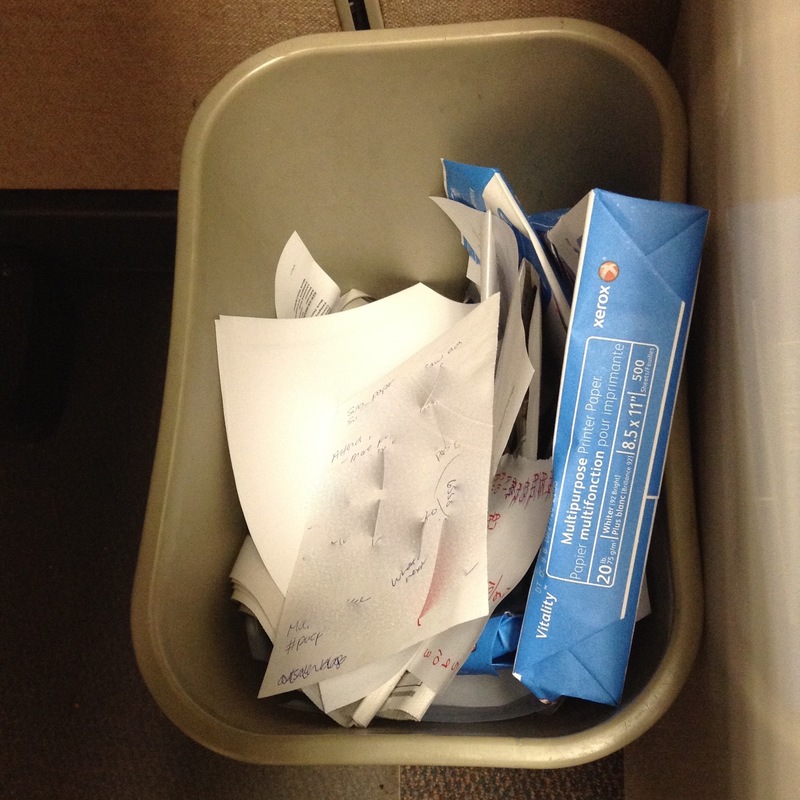 Oh, wow, that’s awesome — our office has a supply of paper and styrofoam plates and cups, and plastic forks and spoons. There’s a cupboard of discarded mugs though. And what a nice story about the woman and her tea pot! Very thoughtful indeed.